In a world where toys are real, and pretend to be lifeless in the presence of humans, Woody, a pullstring cowboy doll is the leader of a group of toys that belong to Andy. Andy lives with his baby sister and mom, and are getting ready to move house. Before they move, Andy is having his birthday party, so Woody sends the Green Army Men on a re-con mission to find out what new toys may be entering the gang. Andy receives a new spaceman action figure called Buzz Lightyear. Buzz believes that he is an actual space ranger, on a mission to save the world from the Galactic Alliance. Woody becomes jealous, as Andy begins to favour Buzz over Woody, and that Buzz also attracts the attention from the other toys. Andy’s mom takes her children to Pizza Planet, but tells Andy that he can only bring one toy with him. Woody fears that Andy will choose Buzz, so he hatches a plan to trap Buzz behind the desk, but the plan goes terribly wrong, accidentally knocking Buzz out of the window. The toys turn against Woody, saying that he got rid of Buzz because he was jealous he was no longer Andy’s favourite toy. Andy reluctantly takes Woody to Pizza Planet with him, and Buzz, in the meantime, has run towards the family car and climbed in. Buzz confronts Woody at a gas station, and a scuffle ensues between them… whilst Andy and his family drive off towards Pizza Planet. Buzz still does not believe he is a toy, and Woody is concerned that they are now really lost. The spot a Pizza Planet delivery car, and Woody convinces Buzz that it will take them to the space port, where Buzz can “continue his mission”. Once at Pizza Planet, Woody searches for Andy, and Buzz climbs aboard a rocket-shaped grab machine game, thinking it is a spaceship. Woody follows him inside, where they are greeted by lots of little green Aliens who worship The Claw, who will take them to a better place. Sid, Andy’s neighbour and rotten little kid who destroys toys for fun, plays the machine, and pulls up an Alien, with Buzz and Woody attached. He takes them home to “play”. Back at Sid’s house, Buzz sees a tv commercial for Buzz Lightyear action figures, with mention of them not being a flying toy. He always believed he could fly, and tries to fly from the bannister to the window… but falls, breaks his arm, and becomes depressed. He’s picked up by Sid’s sister Hannah and she plays tea parties with him. Fortunately, Woody rescues him from his fate as “Mrs. Nesbitt” and they make it back into Sid’s room (escaping from his vicious dog, Scud). Woody climbs up to the window and shouts out across to Andy’s house. The toys don’t believe that Buzz is still alive, and so Woody realises he is on his own to save both Buzz and himself. The highest-grossing movie of 1995. The film won and was nominated for various other awards including a Kids’ Choice Award, MTV Movie Award, and a British Academy Film Award, among others. John Lasseter received an Academy Special Achievement Award in 1996 “for the development and inspired application of techniques that have made possible the first feature-length computer-animated film. Billy Crystal was originally offered the chance to voice Buzz Lightyear, but declined. After seeing the finished film, he said the decision was the biggest mistake of his career. Upon learning this, John Lasseter telephoned Billy’s house to offer him the role of Mike Wazowski in Monsters, Inc. (2001). Billy’s wife answered the telephone and said “John Lasseter wants to speak to you.” Billy took the telephone from his wife and said “Yes”. When Woody is sitting on the bed talking with Slinky, there is a drawing of him on the wall behind them. This is actually an early sketch of the Woody character. This is the only Pixar film to have full opening credits. John Lasseter always wanted Tom Hanks to play the character of Woody. Lasseter claimed Hanks had “the ability to take emotions and make them appealing. Even if the character is down-and-out and despicable.” Early test footage, using Hanks’ voice fromTurner & Hooch (1989), convinced Hanks to sign on to the film. The presence of Bo Peep in Toy Story (1995) is a reference to the fairy tale “The Shepherdess and The Sweep” (1849) by Danish author Hans Christian Andersen. His story was also about toys in a children’s room coming to life when no one is looking. When the film was re-released on DVD, it was found that almost 20% of the original animation files were corrupted, proving to the studio that digital storage was not as feasible as they thought it would be at the time the film was made. 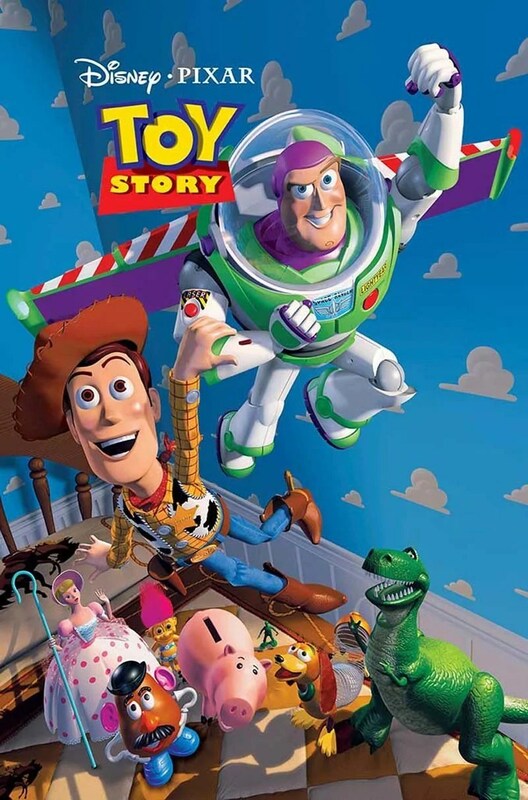 This is the only Film in the Toy Story trilogy to start in the Real World, unlike Toy Story 2 (1999) which started off in a Video Game setting, and Toy Story 3 (2010) which started in a Fantasy Setting in Andy’s Playtime. This is the only film in the Toy Story trilogy where the movie’s antagonist is not a toy, but rather a human. Buzz: This isn’t flying, this is falling with style! Buzz: Greetings, I am Buzz Lightyear. I come in piece. Woody: This is a perfect time to panic! I’m lost, Andy is gone, they’re gonna move to their new house in two days, and it’s all your fault! Buzz: Don’t talk to me about importance! Because of *you*, the future of this entire universe is in jeopardy! Woody: What? What are you talkin’ about? Buzz: Right now, poised at the edge of the galaxy, Emperor Zurg has been secretly building a weapon with the destructive capacity to annihilate an entire planet! I alone have information that reveals this weapon’s only weakness. And *you*, my friend, are responsible for delaying my rendezvous with Star Command! Woody: [pauses] YOU ARE A *TOY*! You aren’t the real Buzz Lightyear! You’re – you’re an action figure! Buzz: [waves in military fashion] Farewell. Woody: [walks off grumbling] Rendezvous with Star Command. Toys are real – Come on, I bet you thought your toys came alive when you weren’t looking too? Voices – the cast is just brilliant, and Tom Hanks is one of my favourite actors of all time. Hamm – he doesn’t say too much, but what he does say always makes me smile or chuckle. Aliens – probably my favourite side-kick characters ever! Never been seen before – Toy Story was the first of its kind, and was ground breaking for all computer animated movies that followed. The sequels – I love that it spawned 2 sequels, with a 3rd in production. After writing this out, I feel the need to go and watch Toy Story! Thanks for reading Day 46 of 100 Days of Disney 2015! 54 to go! Come back tomorrow for another Disney post!